You probably know that Frank Herbert's Dune teaches that "fear is the mind-killer." But what else can you learn from Dune about the power of using your mind and avoiding negative thoughts? Psychologist Maria Konnikova delves into the real-life neuroscience that Paul Atreides taps into. I'm about to make an embarrassing (to science fiction fans) confession: until last week, I had never read Dune. I wasn't even aware that I was supposed to have read Dune. Nor did I know I should be embarrassed at the failure. Consider me properly chastised. Fifteen or so years too late, I have finally finished the book that calls itself-on the cover of the 40th anniversary edition-"science fiction's supreme masterpiece." I wouldn't go quite that far, but I will say that I was surprised by the accuracy of some of its insights into the human psyche, especially when it comes to our ability to deal with stressful situations. 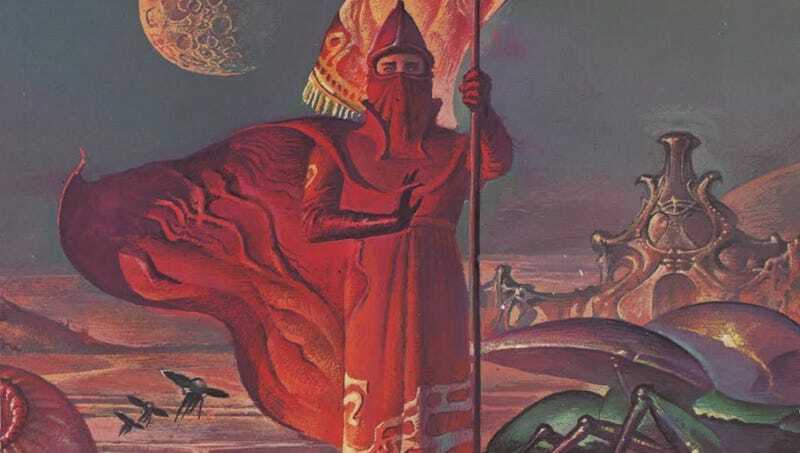 Near the middle of the narrative, Paul Atreides and his mother, Jessica, find themselves alone on Arrakis, with no hope of returning to their old home. Arrakis isn't exactly the most inviting place-it's a desolate desert, with killer worms and treacherous storms to boot-and the pair has no experience in the environment. And yet, despite the seeming precariousness of the situation, Paul makes the most of their circumstances. Instead of panicking at their isolation, he remarks, "I find myself enjoying the quiet here." This, just before a journey that might well kill them both. His mother doesn't quite buy it, but she does think to herself, "How the mind gears itself for its environment. The mind can go either direction under stress-toward positive or toward negative: on or off. Think of it as a spectrum whose extremes are unconsciousness at the negative end and hyperconsciousness at the positive end. The way the mind will lean under stress is strongly influenced by training." Decades of psychological research have proven her to be quite correct. The story begins in 1949, with Donald Hebb. (Actually, it begins much earlier, but you need to start somewhere.) Hebb-a student of Wilder Penfield (who found that stimulating different areas of the temporal lobe during open-brain surgery could elicit different memories and sensations) and Karl Lashley (who quested for the engram, or the location for a specific memory, in the brains of rats)-believed that memories are stored by virtue of repeat association: an action causes activity in a cell, which in turn excites a neighboring cell. With each repetition, the connection between these two cells is strengthened, and over time, the cells become associated with one another, so that the activation of one predictably causes the activation of the other (as Carla Shatz memorably described it in 1992, "cells that fire together wire together"). These strengthening connections are now known as Hebbian plasticity, and Hebb's idea, Hebb's postulate. But Hebb goes a step further than actual sensory experience. As he famously wrote, "You need not have an elephant present to think of elephants." The thought itself can be enough to trigger the type of association that comes with learning. In other words, Paul Atreides need never have been in this specific desert environment in order to react as he does. It is enough for him to have trained his mind for that particular reaction, toward the positive and away from the negative, for the reaction to take place in reality. Hebb's work has since been expanded on, refined, and modified, but the general principle remains the same: training matters when it comes to how we learn and what we remember. Habit is king. Hebb's postulate explains much of the logic behind such phenomena as Pavlovian conditioning (bell plus food equals salivation; fast forward to bell alone equals salivation), Skinnerian conditioning (pull lever, get pellet, learn to pull lever for pellet), fear conditioning and desensitization (think James Watson and poor Little Albert, or James Ledoux and scary snakes), and visual learning (Hubel and Wiesel and monocular deprivation in cats-no visual stimulus during the critical period makes for blind felines). Of course, it's far more complicated than a single postulate, but the basic process is all about how our brains are trained, by our external and internal environment both, to respond to various situations in a predictable fashion. Jessica, however, doesn't just talk about training. She also brings in stress. Here, too, she is correct: where you will see the effect of the synaptic bonds most openly is under highly emotional conditions. There, habit memory-the same type of procedural memory that you use when you do something that you're skilled at, like drive a car or perform an integral function of your job-will take over, and declarative memory-or that memory that functions when you memorize something or when you're still learning a new skill-will recede into the background. Nothing like stress to distinguish real habit from what you wish were habit. In one study, participants who experienced a stress condition-the cold pressor task, where one hand is submerged in freezing (0-2 degrees Celsius) water for three minutes-reverted to habit when performing a forced choice task – whereas those who were not stressed were able to perform admirably on new contingencies. Specifically, habit was chosen at the expense of goal-directed performance when choosing what food to eat: a food that had previously been devalued or one that had not. Stressed individuals chose to eat the same food they had been eating to the point of over-satiation, while non-stressed individuals chose to diversify their food choices. So, not only does stress inhibit new learning, but it pushes the brain to fall back on those habits of mind that are second nature. Of course, the process can vary from person to person-and it's important to remember that stress follows an inverted-U function; that is, performance under stressful conditions actually improves up to an optimal point, and then drops off dramatically as more stress is added-but in general, stressful conditions are not the best for trying to assimilate new information. Indeed, chronic stress can reduce the volume of the hippocampus (an area of the brain intimately involved in memory formation and consolidation) and can aversely impact the dopaminergic reward pathways in the brain, so that we overvalue rewarding outcomes and are impaired in our ability to learn about negative outcomes. In other words, were we to land unprepared in the arid desert of Arrakis, we'd be in bad shape, indeed. Humans are remarkably adaptable. Paul learns quickly to appreciate the positive aspects of his new surroundings, to enjoy the quiet and value the beauty of the new landscape. But he could have just as easily shut down, spiraling into a negative feedback loop and losing his cool entirely. In fact, had he not had prior mental training to dealing with just such stressful contingencies, he would have likely done so; certainly, he would not have been in a position to learn a new positive coping mechanism in the heat of the moment. I take Jessica's words as a timely reminder of the need to train yourself mentally for emotionally charged moments. It's easy to forget how quickly our minds grasp onto familiar pathways when given little time to think or when otherwise pressured. But it's up to us to determine what those pathways will be. This article by Maria Konnikova originally appeared over at Scientific American's Literally Psyched Blog.